This year’s Tech Summit 2018 kicked off again in Dublin’s Conference Centre. The event had a diverse range of influential speakers and representatives such as NASA’s Jordan Evans and YouTube Star, Casey Neistat. Walking into the Conference Centre where the Tech Summit 2018 was being held was an awe-inspiring experience. The building is deceptively big. It’s unique cylindrical glass structure facade sits comfortably at a slant. It’s a bit like if you put an egg perched in some sand, it rests comfortably surrounded by the larger, outer structure. The sun beamed through the glass front illuminating the main foyer with bright sunshine and harsh, black shadows. 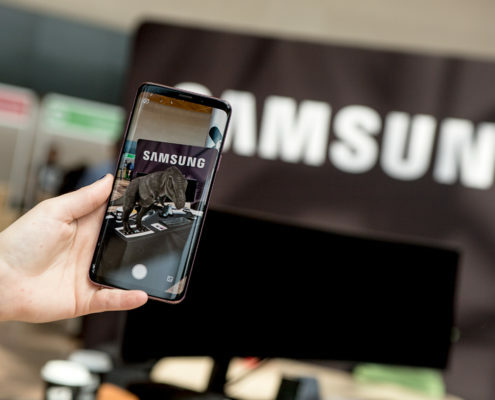 The first installation and in my personal opinion, one of the most impressive exhibits was Samsung’s virtual reality (VR), augmented reality (AR) and 360 camera display. 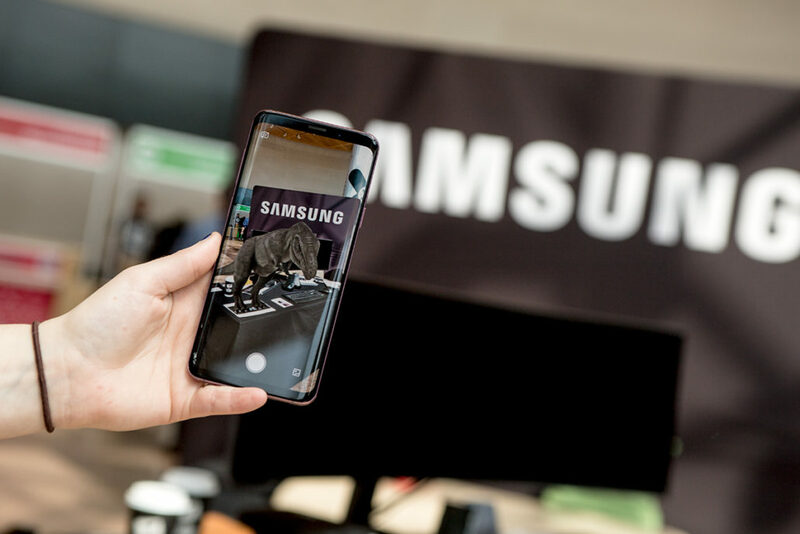 Samsung’s representatives kindly showed me their augmented reality function on their Samsung S9 and S9+ . It was quite amazing looking through the screen on the phone and seeing a dinosaur stand on the table before my eyes. Moving the camera/phone. 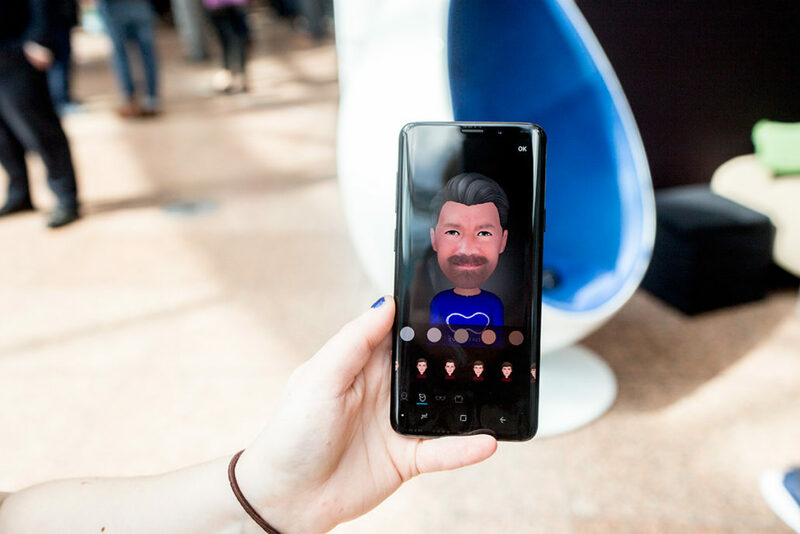 Or the function where you can take a selfie and it will essentially digitize or “cartoonize” the image of your face as an avatar. 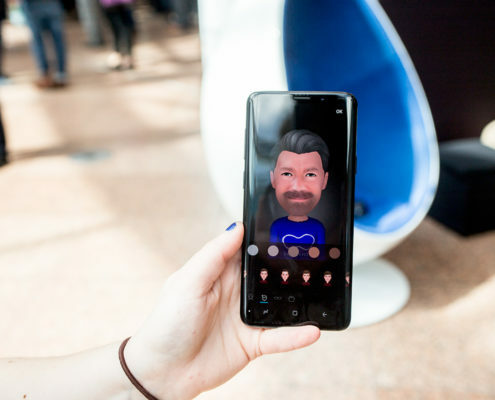 The phone will actually pick up your facial movements. So, while the camera is pointing at you, you can smile, move your lips and your cartoon image will mimic your expressions in real-time. What really we excited me was Samsung’s virtual reality demo. I consider myself an eager, tech enthusiast, a dedicated video gamer, and I definitely wouldn’t be invited to the Luddite’s ball any time soon. I was quite sceptical about virtual reality, until the Tech Summit. For those of you that may not be familiar with VR… You can watch 360 imagery via a headset where you are the centre of the action. The 2-minute demo took me skiing down icy slopes, being on stage with Bono and The Edge, riding on a roller coaster and in the middle of a lively church with choir and band. The moment that truly clicked for me was when I was suddenly transported into a lovely big art-deco style cinema. It was big and empty. I wasn’t concerned about what was on the screen because I was blown away by the sense of space. The sense of realism. I remembered I could look in every direction. I looked to my left and all the empty seats. Behind me, empty. For a moment I forgot I was in the Conference Centre. It was too good to be true. As soon as it was over, I just wanted more. From being a sceptic on VR, I’m definitely now a champion of it. VR and AR seemed to be a running theme throughout the Tech Summit. It will be interesting to see now and over the next 5 years how tech and entertainment industries adopt AR/VR in the future. Overall, the tech summit discussed interesting ideas for the future. It’s a fantastic place to network, to learn, and challenge ideas. It’s definitely interesting to catch a tech summit in Dublin with the current optimism for new enterprise, entrepreneurial pursuits and Ireland’s growing reputation for being a tech hub.